As the saying goes, records are made to be broken. And with a strongly hit single to right field off of Edwin Jackson on Saturday afternoon, Phillies’ shortstop, Jimmy Rollins, broke a record that had stood for the past twenty-five years; notching his 2,235th career hit, surpassing the franchise’s all-time hit mark of 2,234, set by Mike Schmidt back in 1989. Accomplishing the milestone hit in three fewer seasons than Schmidt, Rollins gave Phillies fans something to be cheerful about, after a dismal start to the season has left them wishing for something worth applauding. Sitting in last place in the National League East division — a division that they once dominated — the Phillies are seemingly on their way to a poor overall year, but Rollins’ historic moment in the Phillies 7-4 win against the Cubs helped briefly give excitement to an otherwise dull team. But as is to be expected when a player such as Rollins breaks an all-time record — especially a record held by a Hall of Fame player — many people are beginning to ask the question: Just because you pass a Hall of Famer on a franchise’s hit list, does that automatically make you Hall of Fame worthy? As far as the answer goes, there seem to be three different views. The first view writes off the idea altogether, saying that Rollins’ numbers are simply nowhere close to Hall of Fame caliber; the second group doesn’t feel that Rollins is quite yet Hall of Fame worthy, but could become so if he plays well long enough; and the final portion of people (mainly Phillies fans) see him as a Hall of Fame shortstop right now. For me, I side with the second set of people. On one hand, I don’t think Rollins has a zero percent chance of the Hall of Fame down the road. He’s been far too good of a player for far too long for me to completely dismiss the possibility. But on the other hand, I don’t think Rollins currently has the numbers to stand up against some of the games all-time greats. However, given a few more productive seasons, I could definitely see a good case begin to be made for Rollins. At 35 years old, Rollins still has a few good seasons left in his career, and seeing that he’s always been fairly consistent, Rollins should continue to pad his already good numbers, which aren’t as far off from Hall of Fame level as you might initially think upon a glance. Of the twenty-two shortstops in the Hall, ten of them have fewer career hits than Rollins currently possesses, showing that there truly is no magic number of hits needed to earn election. In addition, assuming Rollins plays for another five seasons, based off of his average yearly totals, he would finish his career with around 240 homers, 1,100 RBI’s, 2,900 hits, 500 doubles, and 500 stolen bases. Given, that’s all purely speculative, but it’s interesting to note, nonetheless. 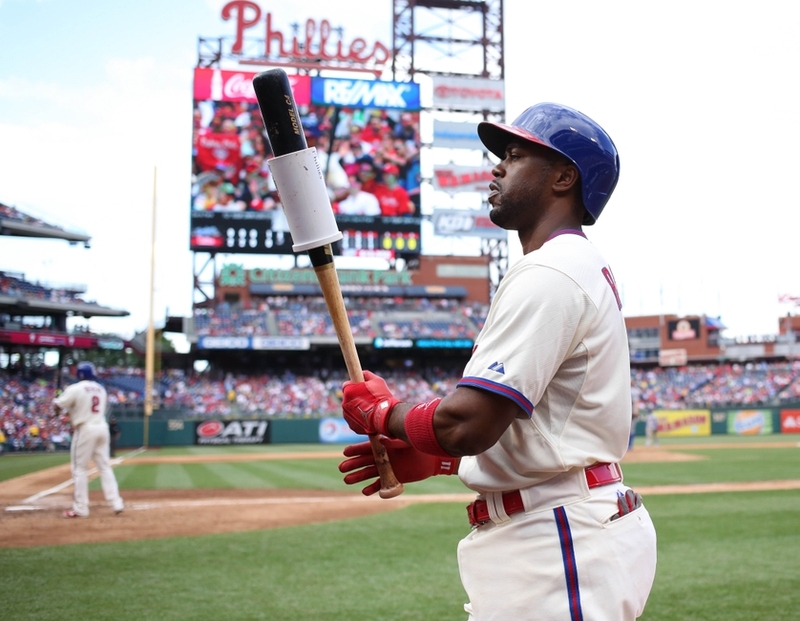 The bottom line, whether or not you’re a Phillies fan, and whether or not you feel Jimmy Rollins is going to get into the Hall of Fame eventually, you have to recognize the amazing career Rollins has put together. Even if he doesn’t go down in the record books as one of the all-time greats in baseball history, he will absolutely go down as one of the all-time greats in Phillies history. With all the fantastic players who have come through the Phillies organization over its 131-year existence, that speaks volumes by itself. Below you’ll find a list of the home run milestones that *should* occur in 2014. I say should because there’s no guarantee that any given player on the list will reach the milestone; they could get injured, have a bad season, or whatever. I’ve made the same type of list the past two seasons, and they have been well-received, so I figured I’d post another one for this season. You can’t be a pitcher. Although there are some pitchers that can hit home runs, you won’t find any on my list. Reason being is that they’re not everyday players. You have to have hit at least one home run in the major leagues. There are several dozen players going into 2014 that haven’t hit an MLB home run, but adding them to the below list just didn’t make sense. You have to be closing in on an even milestone, like 100, 200, 300, etc. I didn’t include anyone that’s a few homers away from number 50, 75, 125, etc. It just didn’t seem necessary. We’re just over a week into the 2013 MLB regular season, and I wanted to post a blog, just like last year, on the fastest and slowest starts to the season for both entire teams and individual players. While it’s a small sample size, the list gives you an idea of what’s been taking place so far this season. Some of the players and teams are performing nearly as well as expected, but others are putting on performances that I never would’ve predicted them to begin the season with. The Braves currently lead all of baseball with a win percentage of .857. Justin Upton has been making a major impact, hitting six home runs in the first seven games, and I fully expected the Braves to have a season long performance like the one they’re currently starting out with. The Diamondbacks, Rockies, Red Sox and Mets are all surprising me, so far, as I expected them to all have poor seasons, and while it’s still very early, at the moment, they’re making things interesting. As far as the Athletics, Rangers and Reds go, it’s not a shock that they’re doing so well. Though I thought the Rangers would have a bit of a struggle this season, without Josh Hamilton, they seem to be doing just fine. It should be interesting to see if they can keep it up. Adam Jones is the only player on the list of fastest start players that I’m not surprised with. Having recorded a 32 homer, 82 RBI season, in 2012, Jones is in the prime of his career, and is set to have another fantastic season. For Jed Lowrie, Carlos Santana, Michael Cuddyer, Carl Crawford and Jean Segura, they better enjoy the hot start while it lasts, because I don’t see any of them having an all that spectacular year. But as with anything in baseball, there’s always the chance for me to be proven wrong. After beating the Rangers, 8-2, on Opening Night, the Astros have done nothing but go down hill, ever since. With 155 games left to play, and just 94 losses away from 100, it’s likely the Astros’ season will end with yet another year of 100+ losses. The Marlins, Padres and Pirates are all teams that have the potential to win now, but it’s likely to be a year or two before they start to become big time contenders in their divisions. The Brewers and Phillies are the only teams that surprise me, somewhat, on this list, but they just haven’t performed well so far this year. And as for the Cubs, they’re just being themselves; destined to make it 105 seasons without a World Series title. No one on this list surprises me, other than Neil Walker. Walker is arguably the best player on the list, but he hasn’t been able to find his groove so far this season. I look for him to get things going, however, and record another season like he has the past few years–10-15 homers and 65-80 RBI’s, with a high 200’s batting average. For Jeff Keppinger, Ryan Hanigan, Aaron Hicks and Pedro Alvarez, it will be interesting to see if they get their acts together, or if this is a sign of things to come for them this season, as things can certainly only go up. Keep in mind, while those are the players and teams with the fastest and slowest starts to the season, there’s still a lot of baseball left to be played, and anything can happen. Only time will tell if the current trends will last; that’s why they play 162 games.